This captivating, timeless book presents over 100 stories written to touch and encourage a teen's heart. Contributing authors include Wayne Rice, Max Lucado, Charles Swindoll, Jerry B Jenkins, Steve Farrar, and Gloria Gaither. 340 pages, from Multnomah. About "Stories For a Teen's Heart"
Alice Gray has compiled 110 inspirational stories that are sure to touch the hearts of teens in this title in the bestselling Stories for the Heart series. Through an even blend of humorous, often poignant tales, teens will be encouraged in life's journey and reassured that they are not alone on the road to becoming adults. Many popular CBA authors offer valuable insights into the human condition in a manner that is warm and uplifting. 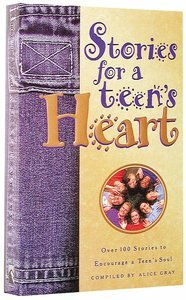 Stories for a Teen's Heart will revitalize the spirits of young people. Nourish the souls of your young people with this collection of 110 bite-sized stories! Humorous, poignant, and uplifting, these quotes, anecdotes, and encouraging tales from best-selling Christian authors speak straight to the issues kids face. A great gift for on-the-go teens that reassures them they aren't alone as they walk the road to adulthood. Gray has compiled 110 inspirational stories intended to touch the hearts of teens in this newest release in the bestselling Stories for the Heart series.